There are some friends you've known all your life. There are the friends you've just met and the ones you talk to on a daily basis. 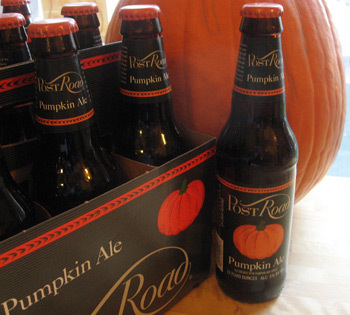 Then there are the friends who know you so well, they send you twelve individually wrapped bottles of Post FREAKING Road Pumpkin Ale! A few days before my birthday, Mathra lugged up a heavy box covered in duct tape. It was from our friends in Boston, Nate and Genevieve. Knowing that Gen had recently asked for our address and had also mentioned a recent pumpkin beer tasting, I had a sneaking suspicion as we ripped into the box. However, that sneaking suspicion didn't stop me from crying when I rolled that first brown bottle out of its bubble wrap. That's right. I shed TEARS. Over BEER! I'll tell you what, they've upped the stakes. Last year, we sent them an autographed bottle of Boston Red Sox player Kevin Youkilis' hot sauce from brother Scott Youkilis' restaurant, Maverick. This year, they sent us the beer we've been pining after for over five years.